Through hands-on experiential learning in science and technology, professional and development schools, and performance and ensemble opportunities, Wayne State prepares students for careers in Nebraska, the Midwest, and beyond. Whether your dream career is in the field of health care, industrial arts, education, criminal justice, graphic design, business, or sport management, among countless others, Wayne State has the keys to your success. 100% of our graduates are employed or in graduate/professional school. Based on the 2016-17 graduate survey. 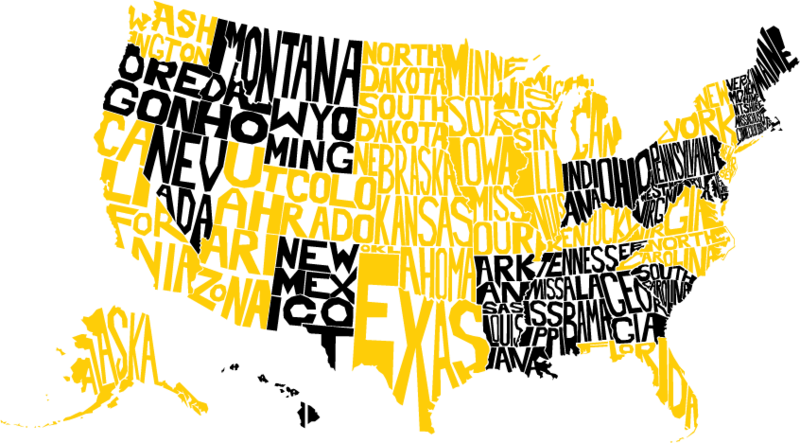 The gold states show where 2017 WSC graduates are living now. 81% of 2017 Graduates Stayed in Nebraska. Of those that are employed or in graduate/professional school, most are still in Nebraska. Based on the 2016-17 graduate survey. Wayne State students graduate with less debt than the national average. With a degree from Wayne State, you'll be ready to change the world for the better. Whether it's creating notable art sculptures, being recognized as an outstanding teacher, continuing an excellent career in sports, providing clean drinking water, travelling the world, or leading a successful business, our Wildcat alumni are making a difference. Career planning is an information-gathering, decision-making process. You'll need to consider not only what field of study you're interested in, but also your skills and personality, as well as data about various occupations. Successful career planning makes decisions based on this information and forms a careful plan of action regarding steps to be taken toward career goals. Wayne State's Career Services office can guide you in this process.